Set in the not-too-distant future in ultra-conservative Texas, this novel is quite a departure from the author’s first novel, Mudbound, which was set in Post-WWII Midwestern America. And yet, there are parallels: prejudice and stigma, oppression, and a female protagonist with an inner strength and resoluteness to rise above her situation. 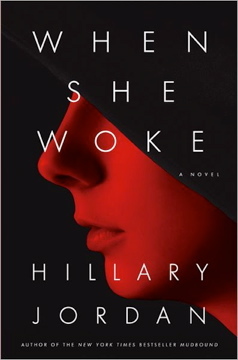 When She Woke is a futuristic retelling of The Scarlet Letter, Nathaniel Hawthorne’s 1850 novel about a woman scorned; found guilty of adultery – and bearing a child out-of-wedlock, the product of that adultery – Hester Prynne is sentenced to wear a blazing scarlet letter A on her person so that all who might see her will know of her crime. When She Woke’s Hannah Payne (the protagonist’s name is only one on a list of similarities to The Scarlet Letter; both heroines are seamstresses, and like Scarlet’s Hester, Hannah names her aborted fetus Pearl in an exceedingly creepy scene) is convicted of murder and sentenced to sixteen years of melachroming – the process developed by which a person’s genes are altered so as to render their skin, from head to toe, a monochromatic color to fit their “crime.” Hannah’s crime is abortion and her punishment is living for the next 16 years as a “Red” – scarlet from head to toe – and forced infertility by way of a surgical implant. Raised by a devoutly Christian family in an era when there is no separation of Church and State in America, Hannah had dedicated her life to the church and family, and living a virtuous life. When Reverend Aiden Dale, a charismatic, world-famous pastor enters her life, however, the mutual attraction can’t be denied by either of them, and eventually, predictably, though he is a married man, the two succumb to an illicit affair which results in Hannah’s pregnancy. Out of fear of the ramifications of raising an illegitimate child alone, and knowing that a man in Reverend Dale’s position could not acknowledge or help her raise the child, Hannah decides that an abortion is the her only option, and really, the most humane option for all concerned. However, abortion is now illegal and considered murder in the first degree. Unfortunately, she is apprehended immediately after her abortion, the authorities having been tipped off by suspicious neighbors. After her trial and sentencing, Hannah wakes up to find herself transformed into a blood-red person. Eventually she is released from her short-term stay in prison and must try to make her way in the world. But how? She is shunned and the target of violence at every turn because of her Red status. What follows is a journey of survival and self-discovery, during which Hannah finds herself first in a halfway house run by a cultish, sadistic, fanatical couple, and then on the run, constantly eluding capture, violence, and death. Her goal: to reach Canada, where her melachroming can be reversed, though she will have to live the rest of her life with no contact with anyone from her previous life – a sort of witness protection program. Along the way, she confronts her long-held beliefs about herself and her faith and discovers a self she never knew. At times I found myself cheering for Hannah, and at other times annoyed by her. Just when you think she’s gotten wishy-washy Reverend Dale (he of the saccharine declarations of love that made me want to slap him) out of her system, she gets to missing him again and imagining an actual future with him – even when said prospect is clearly futile and we, the readers, can see she’s a million times better off without him. Then there was the whole faith/religion thing, which I found tantalizing. What would it be like if the separation between Church and State ceased to exist? I anticipated the vilification of God and religion in general, but instead, while Hannah ends up rejecting a great deal of the dogma she was raised with, she’s fool enough to believe that one can just reinvent God however suits one. Hogwash. With a very Margaret Atwood dystopia feel to it, I found this novel very readable and intriguing, though often pretty far-fetched. I guess when projecting what the future might look like, far-fetched is difficult to avoid, though. Liked it, didn’t love it.